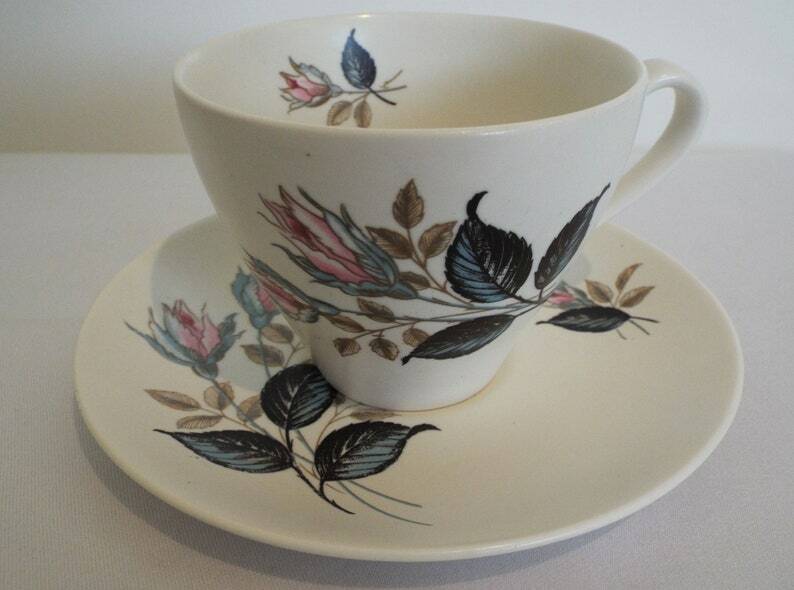 Elegant and beautiful, this highly collectable English 1950s teacup and saucer is by highly collected English pottery J & G Meakin. It is from a fabulously retro pattern range, and is the height of mid-century modern tea time style! The teacup's wonderful white-cream matt shade of china is the perfect background for the images of stylised pink roses in bud to just leap off the teacup and saucer! The teacup is a very simple and stylish shape and I love how the pink rose pattern is repeated inside the teacup with a little rose bud inside the cup. This teacup and saucer would make a wonderful tea set for tea time and would be a perfect vintage gift for someone who loves tea and mid-century style! It's a simple and beautiful little item that perfectly sums up the style and mid century modern designs of the 1950s. In good vintage condition - which is hard to find as this tableware was intended for everyday use in a stylish and modern 1950s home. There are no crack, chips or crazing to the glaze. The rose images are in good condition. There are the tiniest of tiny odd few flea bite nibbles in the underside of the teacup base, which are simply as result of normal use, do not affect soundness or usability and cannot be seen unless the teacup is turned completely upside down, and even then they are exceptionally minor and of no issue. Any further wear or marks are commensurate with age and the contemporary manufacturing process. Please remember this is a vintage item and therefore cannot be expected to be in pristine modern mint condition, but please do just ask if you would like any further photos.